You are here: Home > What do terrorism and vaccination have in common? What do terrorism and vaccination have in common? Do political threats influence the way we view medical threats? That’s the conjecture of those who claim that the primary political threats of a generation define the identity of the medical threats that command the attention of the general public. According to the theory, the primary political threat of the early 20th Century was war, an attack on the self by others, and the medical threat that captured our attention was infectious disease, an attack on the body by external pathogens. In the late 20th Century we were preoccupied by the threat of internal dissension, fear of Communist spies and others of insufficient loyalty undermining the country from within. Cancer became our medical preoccupation, a disease of internal betrayal. They are invisible, but all around us. They constantly threaten people, often people who unaware of their very existence… [I]t is axiomatic that they have be released into our environment by “evil” corporations. Like many other purveyors of alternative health quackery, vaccine rejectionists are obsessed with the notion that they are secretly being poisoned by big corporations. In other words, vaccination is feared as corporate terrorism. Consider why terrorism inspires so much fear. Terrorism is a catastrophe caused by deliberate action of others as opposed to mere chance. Although a person is far more likely to be killed by an auto accident than by terrorism, people routinely dismiss that risk by adopting an attitude of fatalism. Since accidents are supposedly random there’s no point in worrying about them. Terrorists can concoct their nefarious plans while living unrecognized among us. As a society we have become obsessed with terrorists “threats” that are presumed to be invisible yet always among us. We have adopted an ever growing list of measures to prevent terrorism, most of which are largely ineffective (airport screening) and some of which are down right ludicrous (inspection of car trunks before being allowed into parking garages). In a curious way, terrorism is viewed as a technological threat, while random causes of death (even if they involve technology) are viewed as “natural” and therefore better. 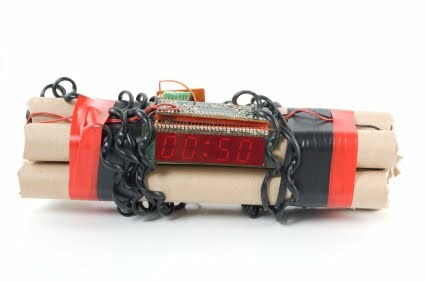 Terrorism often takes the form of exploding devices, ranging in sophistication from those that spread shrapnel, to those that spread deadly chemicals to the ultimate threat of “dirty bombs” that spread radiation. You are every bit as dead if you fall into the ocean and drown, but people do not spend a lot of time worrying about being a victim of drowning even though it is far more likely than being a victim of terrorism. Fear of vaccination mirrors the fear of terrorism. Vaccine injury is the product of a deliberate action (receiving the vaccine) as opposed to injury from the infectious agent itself. Although the odds of dying from a vaccine preventable illness are approximately 1,000 times higher than the odds of dying from the vaccine, vaccine rejectionists routinely ignore that risk by adopting an attitude of fatalism. Since diseases are supposedly random, there’s no point in worrying about them. Perhaps the scariest thing for vaccine rejectionists is the notion that vaccinations contain unrecognized threats that are free to circulate among us because of government mandated vaccination. Vaccines are viewed as a form of corporate “terrorism”, where unsuspecting individuals are unwittingly poisoned by being tricked into accepting vaccination for their own “good.” Because we don’t recognize the threat, we cannot protect ourselves against the threat. Finally, vaccines represent technology (difficult to understand technology, no less) and diseases are “natural.” There are vaccine rejectionists who proclaim with a straight face that it is better to acquire “natural” immunity to an infectious disease by actually contracting the disease than to acquire purportedly unnatural immunity through vaccination. Of course acquiring “natural” immunity requires that you survive the infectious disease, a critical fact often overlooked by vaccine rejectionists. Obviously the analogy between political fears and medical fears is imperfect, but it is worth pondering whether the fears of vaccine rejectionists are shaped by current political preoccupations. At the very least, it may suggest new avenues for public health education, combining basic education in immunology and science with careful attention to the unarticulated fears of vaccine rejectionists. ← How do homebirth midwives handle mistakes?